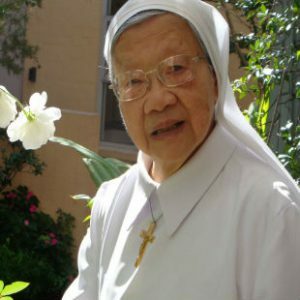 Sr Jacinta Fong, who will go back to her support role for doctors and nurses in the Emergency Department of St Vincent’s Hospital in Sydney as soon as she has her doctor’s approval. 1) When did you know you had a vocation? I was three, and a pagan. One of my brothers told me about the nuns who taught him, and I decided then that was what I wanted to do. Of course, I had to convert first. 2) How did your family react? They were happy for me. But initially, I wanted to joined the Carmelites, an enclosed order, and they weren’t too keen on that. Then I decided on the Sisters of Charity, and they were much more comfortable with that choice. 3) What was the process like then to join the Sisters of Charity in 1952? I still had to get approval from my family, because I was only 16. My mother and father had both died when I was child during the war, so my brothers and sister were my guardians; they gave their permission. I have never thought twice about my decision since then. 4) How many joined with you, and how many are still in the Congregation? There were 14 in the year before, nine in my intake. Six were professed. Sr Moira O’Sullivan and Sr Marie Stanley and I continue on. 5) You were a nurse? Was that something you were keen on pursuing? Yes, I wanted to take care of the sick. I always had a tendency to look after the sick poor in particular. 6) What is the major difference you see now in religious life compared with when you first entered? It is much more free. Then, it was very strict. We had to go out in pairs, even go home with a companion. But after Vatican 2, things began to change. Many of the Sisters stopped wearing their habits, and began to wear street clothes. I never did. I always wear my habit. The doctors at the Emergency department often ask me to accompany them on their rounds. It often happens that extremely aggressive patients can see me in my habit, and that gets through to them – they calm down. I wear the habit because it has a purpose.